Don’t expect to win with this long shot but you never know when it will come in and just might get a couple more Ponies. Either before or after the races head west from Turf Paradise in Phoenix on Bell to 51st Avenue and look for it on the south side of the road. Walking through the crowded parking lot led us to having a very high expectation of the breakfast we so hungrily wanted. Customers were coming and going everywhere. Why wouldn’t I expect that as three times before I have come here and turned back east and found another breakfast joint because of the wait times at this place? Stepping through the front doors one is immediately met with a welcome and seated promptly. We had a booth with a giant big screen just over our heads hanging on the wall. Several other fellow breakfast patrons kept looking our way and then I realized what they were staring at was not us but the news on the screen. 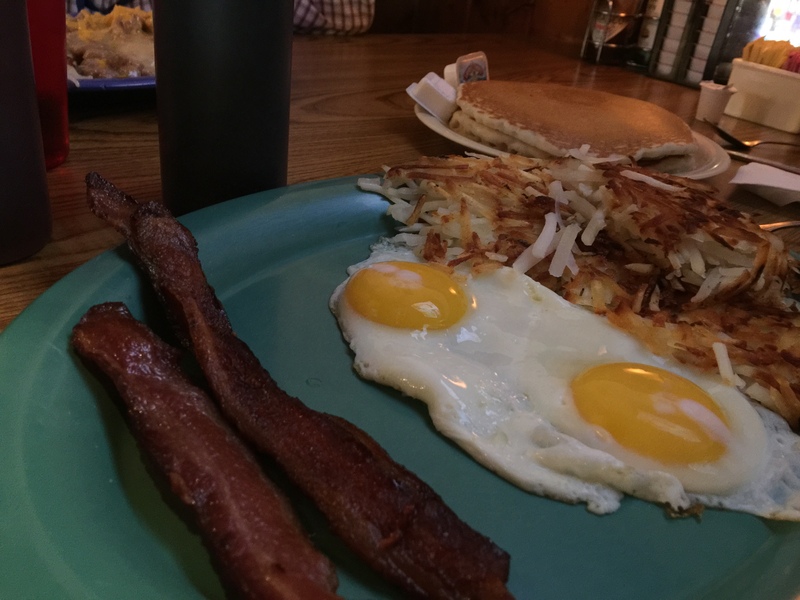 Once we were over the staring and could concentrate on the menu, my partner ordered the Huevos Rancheros, 2 eggs over medium, a tall OJ and a water chaser. I on the other hand, ordered 2 eggs sunny-side-up, 2 strips of their special bacon, crispy hash browns, 2 pancakes and a side of gravy with 1 biscuit. I always check the staples out first. The food was on the table in minutes. I knew then that the quickness was a sign of something bad to come. I put the condiments I like on my meal and picked up a slice of the perfectly cooked bacon so it appeared. The appearance fooled me again and I knew it as soon as I bit into it. Last nights bacon for sure. I felt as if I was eating a shard from a retread tire on the I-17 which was flung off the rim because of a too-cheap-to-buy-a-real-tire semi-truck driver. I handed my partner the other slice for his opinion. His teeth met the meat and he pulled hard back on the strip. I heard his neck crack. He stopped and placed it back onto my full plate. I noticed the two containers of butter which were resting against the edge of the pancakes. “I hope she washed her hands,” I said speaking of the waitress. “She’s only touched the last hundred people’s plates and now she’s touching my pancakes by proxy of the fake-butter containers. I looked at the label and asked across the table if he could read it before I pulled it away from the plastic cube. He peered at it for some time before giving me the news. “It says a buttery tasting spread,” he answered. “That’s perfect. Chemically enhanced, buttery tasting partially dried yellow hand lotion on my cakes,” saying it as I hid the two containers behind the artificial sugar holder with pink and yellow envelopes of carcinogens. The pancakes were rubbery and I shared one with John. He nodded the acceptance as his mouth was full of canned Huevous sauce. He eats like a horse. The syrup soaked disc slid it off the plate accidentally while trying to cut a piece off of it with his fork. I pushed my half of the order close up against the buttery tasting spread and covered the dead body with a napkin. The eggs were decent but it’s really hard to send out bad eggs without noticing they’re bad in the beginning. The potatoes were crispy as I ordered so I finished most of the ketchup covered delight. The biscuit surprisingly looked and felt homemade when I tore it in half but here comes the finale. The gravy, a telling of truth, was either out of a can or the cook likes enriched flour a lot. Very little taste and I know for sure as I’m a gravyholic since childhood. The waitress asked how our meal was and we just smiled. My coffee cup was empty and she noticed it and even made mention of it. She came back with coffee as we were getting up. She still filled it up and filled it with Decaf although that was not what the original cup was about. I stood up and began to leave the white steaming cup behind. “Do you want a box?” she asked. “No, you can have it. Thank you for the meal.” I answered. She smiled at my comment and then focused her eyes at the uneaten cake that was not breathing and showing no signs of life underneath the paper napkin. “it’s unfortunately dead,” I quipped. For that wonderful serving of a simple breakfast, you, ‘The Place’, gets 2 Ponies. Least I didn’t give you 1 or worse, a Feedbag even though I started to do just that. You have potential but you still need a few good workouts. Good Luck. Oh yeah, just one more thing, Mike and Rhonda as you move into improvement of this place.